Maduro accused Western countries of “trying to put pressure” on Venezuela to overthrow the Bolivarian Revolutionary government. May 16 (teleSUR) Venezuelan President and presidential candidate Nicolas Maduro foresees nothing less than a “great victory” for him and his party, the United Socialist Party of Venezuela (PSUV), come the May 20 presidential election, he said during an interview with France24 channel and added that increased attacks against him and his government indicates the Western world’s fear of his victory. 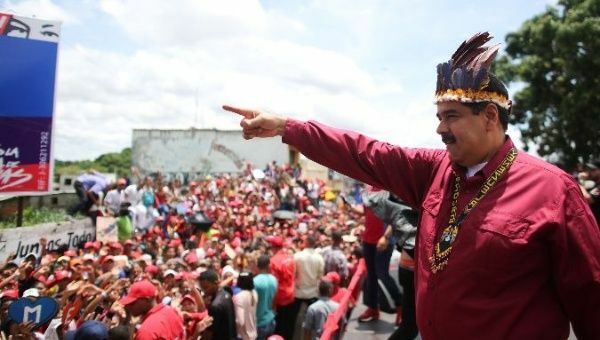 Maduro accused Western countries, particularly the United States and France, of “trying to put pressure on the country” in order to overthrow the Bolivarian Revolutionary government. Though he didn’t rule out an invasion attempt or coup d’etat sponsored by the United States, he assured that the latter will not materialize, as did happen in 2002 when the late Venezuelan President Hugo Chavez was deposed for a two-day period by some within the ranks of the armed forces. He denied that Venezuela’s economic situation is as critical as the mainstream media portrays it to be. However, he did acknowledge that “there are some economic problems” that “will be resolved,” according to France 24.